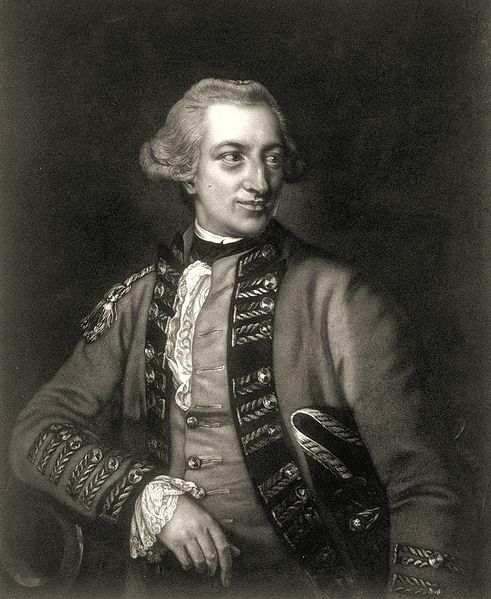 Lord Hugh Percy, the 2nd Duke of Northumberland and holding the rank of brigadier general commanded the relief brigade that was ordered out from Boston by Sir Thomas Gage after Lieutenant Colonel Francis Smith had sent back a messenger asking for reinforcements. Little did Lord Percy realize at the time that by the late afternoon of April 19th, one quick decision saved the lives of countless British Redcoats and hundreds of American militia and minutemen. At the same time, he may have unintentionally prolonged the Siege of Boston. The history of April 19, 1775 is well told, British soldiers march into Lexington where they fire on militia drawn up on Lexington green. They then continue onto Concord where the British search for military munitions and supplies; the object of their foray into the countryside in the first place. When smoke billowed up from the town due to the British burning military accoutrements, militia across the Concord River mistake the conflagration and interpret the blaze as a sign of the British’s intent to burn the town. While this first contingent of redcoats retreated back toward Boston, a relief party, commanded by Lord Percy ventured out from Boston by way of Boston Neck and crossed into Cambridge upon the bridge that bore the same name. Lt. Col. Smith had called for reinforcements as soon as the situation around Lexington began to unfold that morning. Percy’s men arrived in Lexington in time to see Lieutenant Colonel Francis Smith’s retreating redcoats harassed by an ever increasing militia and minutemen force. After providing approximately a half-hour of respite for Smith’s beleaguered forces, Percy organized the withdrawal back toward Boston. In doing so, he learned a valuable lesson at a small hamlet along the “Battle Road” called Menotomy. Although just a smattering of houses situated at a crossroads. Roads leading to Lexington and Cambridge on an east-west axis and also Woburn and Medford, Massachusetts on a north-south line. On April 19, these roads did not lead away from innocent Menotomy but to the important crossroads junction. And with that Menotomy would be a harbinger of what the road ahead could be like. Besides the ever present rock and stone walls that separated farm fields, the militia could and did us houses to take pot shots at the British column. In turn, Percy’s flankers did a double envelope, sweeping far to the side of the column and trapping some militiamen between them and the main British column. Other flankers began searching houses and with desperation and frustration mounting from being under constant attack, the situation became desperate for local inhabitants and the militia responding to the unfolding action. Add to that the lack of command cohesion with the militia, which had been operating without a unified command structure, as each company or regiment arrived at different times and junctures, listened to their immediate leaders. With British flankers scouring buildings and militia using whatever cover they could to fire off shots at the redcoats, Menotomy became the bloodiest part and town on April 19. When the British cleared the town, they had suffered 40 killed and double that wounded. American casualties included 28 killed, wounded, and three captured. Inside John Russell’s house, one of the few buildings in the town, nine militiamen from the town of Danvers two British redcoats, and Russell himself lay dead. Altogether, half of all casualties suffered that day fell around the town of Menotomy. With daylight waning and the lessons of Menotomy fresh in his mind, Percy made the most fateful decision of the day. He turned from the road, avoiding the bigger town of Cambridge and instead headed back toward Charlestown. This decision removed the obstacle of the hotbed of patriot fervor that Cambridge was, removed the real threat of a house-by-house urban fight with an increasing militia presence, and removed the logistical nightmare of trying to traverse the bridge. Although, he did not know for certain, Percy did surmise correctly that militia had removed the planks from the bridge across the Charles River. By turning toward Charlestown, he could catch the militia off-guard, which he did, have the more defensive terrain of the neck, and be under the powerful protection of the British navy. One of the junior officers on the march was a little more emphatic in his remembrances. With a few shots from the artillery accompanying Percy’s column, the fighting was over for April 19th. The casualty list greatly shortened by one British aristocrat turned officer. This entry was posted in Emerging Civil War, Revolutionary War and tagged 1775, American Revolution, April 19, Battle Road, Boston, Cambridge, Concord, Lexington, Lieutenant Colonel Francis Smith, Lord Hugh Percy, Menotomy, Minutemen, Rev War. Bookmark the permalink. Interesting use of small unit maneuver tactics to respond to the non-traditional fighting style used by the militia and minutemen on the part of Lord Percy. An aspect of the April 19th fight I was not aware of. I wonder if Percy’s ‘lessons learned’ was passed on to other British commanders.